Random part showed up in rear locker... What is it? Looked in my rear locker and found this piece. Looks like a engine mount maybe? I also noticed the belt is all the sudden warn on the backside. I looked all around it and nothing is even close to it. Wish I had more for you but it appears as either a mounting bracket or trans shift link. The ru ber donut and the notch opposite make me believe it actuated something and must have been intended for some movement. Does boat performance, sound or feel changed since this happened or are you driving it with no issue and happened to find this?. Looks similar to a mounting bracket for the impeller on mine. That's what I thought too, bracket for the raw water pump. If so, only the hoses are keeping it from spinning. Haven't had any problems with performance. Took it out surfing for 3 hours the other day with no issues. The odd part is the part was laying in the right rear locker past the divider. I will have to take another look at it and see if I can figure out where it came from. I did look at the impeller yesterday and it appears to have a bolt holding it down below it. From your picture in the other thread - look where the red arrow is. Typically that is where there should be a bracket bolted on. Can't tell from picture if it is there or not. I will take a look when I get home and let you know. Thanks for the insight! It boggles my mind if that is the case how it got from that location to 2-3 feet over past a wall. I was able to feel a bolt/nut straight down below the fresh water pump that must be holding it down. That is the raw water pump mounting bracket. 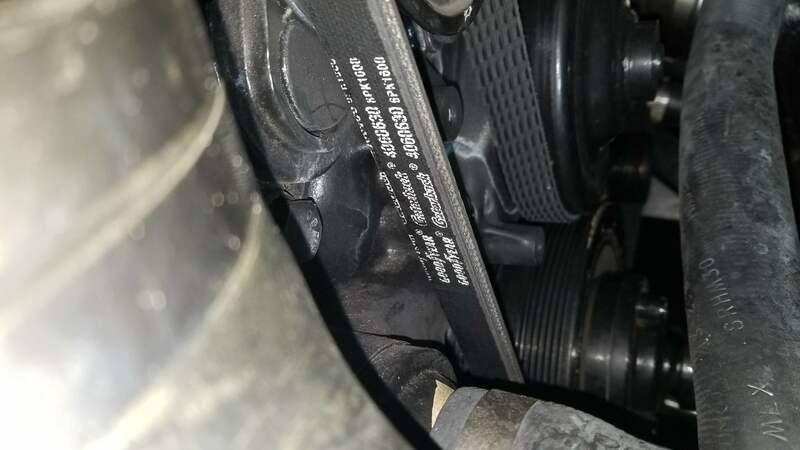 It keeps the raw water pump from spinning on the crank shaft, although the rubber hoses will do the same which is why you probably never noticed any difference. 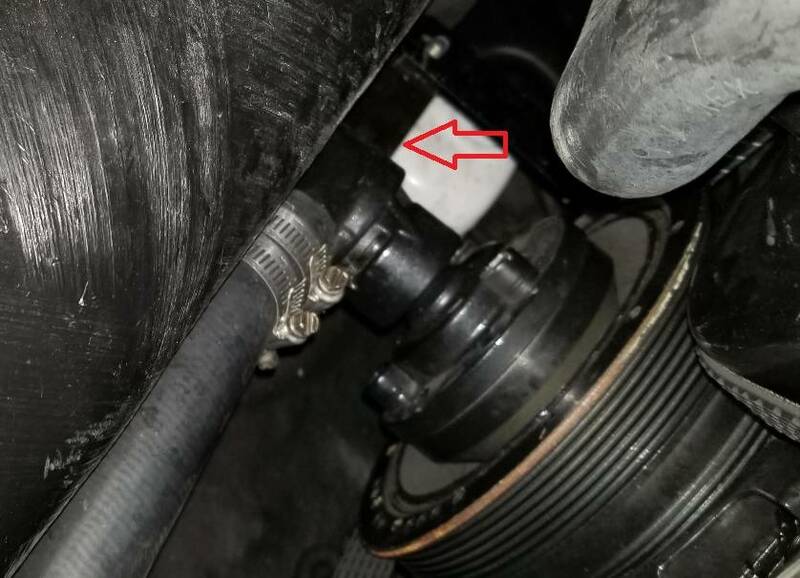 I would like to remove the fiberglass exhaust manifold in order to fix the impeller bracket, replace the impeller, and change the belt. Have you guys done this before? 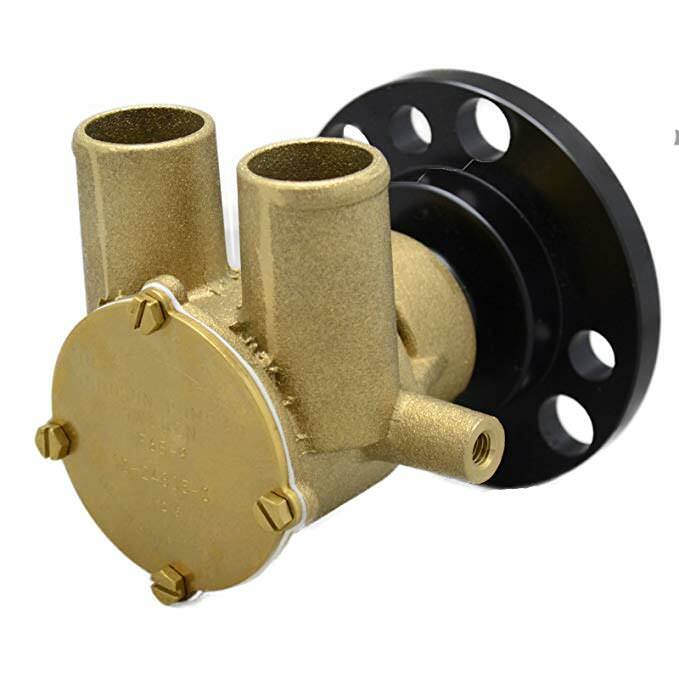 You can change out the raw water pump without removing the manifold. I will see if I can't figure out a way to squeak the top bolt out of the pump. I couldn't even fit a wrench in it the first time I tried. Maybe I can move the exhaust manifold a little towards the back of the boat. I would not be OK not knowing where that came from. The raw water pump would make sense and could be causing the wear on your belt as the belt could be slipping without all the brackets. When you removed it did you have to remove the 4 bolts from the pulley then a single bolt going up into the pump from the bottom? Was the bracket I found on the side somewhere? That threaded thing you see on the right of the picture is where a bracket attaches to keep the pump from spinning. The pump is upside down of its normal orientation in that picture. Even though there are threads there mine just had a rubber grommet that is pretty much the same as the rubber piece on the one end of the bracket you found. When I removed the pump I had to disconnect the hoses and that bracket. Then there were 3 allen bolts that go through the black part into the pulley on the end of the crank shaft. 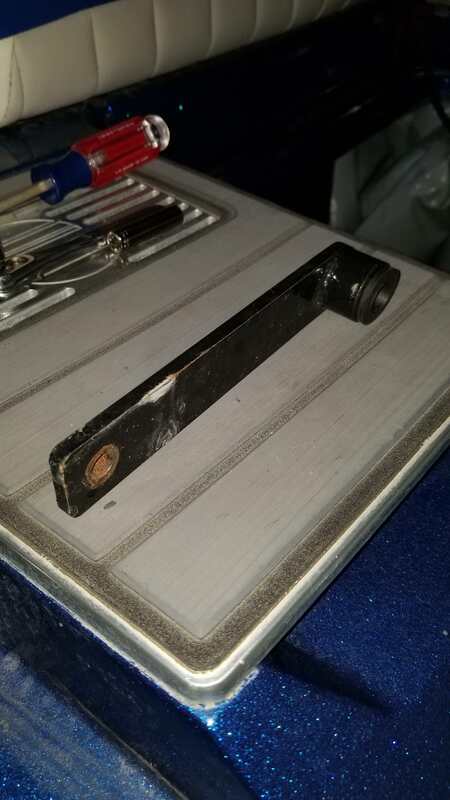 I tried a couple of allen wrenches but ended up going and buying a socket with the allen fitting so I could get a wrench on it with some leverage. Pretty easy at that point. So apparently the two mounts for the pump are still on it and secure. It looks like the exact same piece though for sure. Any other ideas? Sounds like someone dropped or lost the one you found at the factory or during a previous impellor or pump replacement. That's what I was thinking. I looked all around and couldn't find anything that even remotely resembled this piece. I also found two more screws at the bottom that look like the ones for the engine/locker dividers. If only I could find my 8mm that dropped into the abyss. The seal went bad on the original pump and the pump was replaced. Somehow the bracket went unaccounted, so someone else's boat went without for awhile or "they" had an extra bracket laying around and you ended up with it.